add an important caveat: The most popular promotional products to use at a trade show, may not be the BEST promotional products for YOU to use at a trade show. 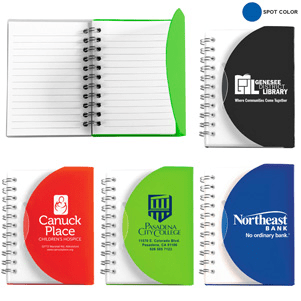 The most important thing to keep in mind when choosing promotional products is that they be USEFUL and NEEDED to the person who is going to be receiving the advertising. With that in mind, I am sharing here 6 of the best promotional products to use at a trade show. If there’s one universal trade show truth, it’s that trade show attendees always need pens. Whether it’s to jot down a contact’s information or to serve as a follow-up reminder, the right pen can mean the difference between new business or missed opportunities. I would suggest you use a very inexpensive pen on the trade show table and “sacrifice” them to the Trade Show Gods. In other words, have something on the table for the “Trick or Treaters” whose main job at the show is to fill up their bags with free stuff. They consider it a successful trip to a show if they fill up their bag. If you use a second, more expensive pen, leave them in your pocket for the people who actually spend some time with you at the booth. Away from home? Your environment changes and so does your skin. Especially the skin on your lips. Having chapped lips is an almost constant occurrence on trade show floors. With the constant conversing and circulation of dry air, attendees tend to find themselves in need of lip balm. You can use a flavorless option so that men and women will reach for your product or have 3 flavors available. Along with chapped lips, you are going to be shaking hands with, hopefully, lots of people. And each of those people has shaken hands with hundreds of people. And so on. That is a lot of germs being shared. Heck, makes me want to spray my keyboard while I am typing this. Washing your hands a lot will help you not get sick, and between washings, use the sanitizer. People will love getting these from you. Even though I am definitely not a fan of using food products as promotional products, this is one of my favorite promotional products. Everyone loves the smell of popcorn. And at a tradeshow where people are staying over at a hotel, it is an ideal snack for their room that night. Print your info on the bag. Point out the QR code you have printed on the bags for a special offer. You should also investigate adding an info card into the cello wrapper. Or you can staple a flyer to the bag. ASK THE RECIPIENTS to check out your website and specials while they eat the popcorn. Much like pens, notebooks are always in-demand at trade shows (there’s only so many available margins in the show guide to scribble important notes). Put your company’s logo front and center, and you’ll have a walking brand advertisement. Add the cost of imprinting on each page and you have a great give away. The last trade show I attended taught me a valuable lesson: Never attend a trade show without a charger. I scrambled across the show floor for hours hoping someone could lend me an iPhone charger so that I could stay in contact with my coworkers. If any company had utilized mobile chargers as its trade show giveaway, I would have been forever grateful to that company. These are a few of the best promotional products to use at a trade show. If you are looking for other ideas, call us at 800-705-4265 and we will work on the project for you. Please let us know the number of people who the show tells you will attend, the number of booths, and your budget for the show. That will help us get you the best return on your promotional product investment.